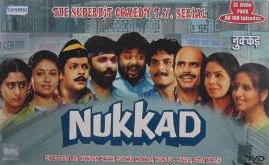 Episode #3 of Hindi TV Serial Nukkad explores a politician’s visit to Nukkad! It is definitely one of the most perfectly filmed satirical TV episode ever. Here is the summary of the episode content. A politician named Mr. Sinha hatched a plan to get publicity. He have asked Kalabaaz that he will be coming with a few press reporters to their society and He will be passing through the Nukkad. Kalabaaz have to make arrangement that the people at Nukkad should praise the work and efforts the politician applied for their development. The entire scenario should produce the image of the politician as the real social worker, who not only speaks but actually works in favor of the public. And though it is preplanned, it should look like spontaneous visit of the politician, and public’s genuine gratitude towards him! They all will be paid for the same!! They will get different amount of money for the task they are allotted; like ask a question, shout slogans in favor of the politician, and so on! The questions are pre-defined! So actually it is all for publicity. No real questions! No real public service! No real efforts for public welfare! No stuff was done, nor to be done! Sound familiar?! You should not miss this fantastic episode. It is armed with the fantastic acting for each and every actor. Just naming a single one will do injustice with the other. Each and every actor does their beat in very convincing manner. They doesn’t look the actors, but they appear as the real characters! And that is the real success of the entire cast and crew of the TV Serial. However we don’t see Hari, Band master and a few other members in this episode, almost everyone apart from them are present in this episode. It is the tightly and smartly written script which is the essence of this episode. The background music is really effective. The direction is superb. Despite of very tight budget, the cinematographer and the art-director did their job fantastically. The wardrobe is authentic and the direction is simply superb. With that we must say the dialogs are really the heart of the episode, both in terms of writing and execution! The conversation between Kalabaaz and his sister. The expression of the policeman each time he got to know that everyone else but him is paid for this visit. The conversation between Guru and Raja. Kalabaaz’s efforts to train people with the dialog, and other welcoming stuff for the visit. People’s blindly following up the Zindabaad-Murdabaad pattern while shouting. Teacherji’s conversation with the politician. We are used watch TV Serial episode in high definition video with crystal clear sound, rich looking sets and cloths and some fantastic special effects, these days. Which the current generation will miss while watching this DVD set. Final verdict: You must watch this episode. It proves that good content, fantastic performance and superb execution can be done even with the tiny budget. It is as effective as much it was when aired initially, and will remain the same.